Sometimes my Bengali genes give out a loud shout and I am compelled to cook something essentially Bengali. No fusion, no inspired creative moments allowed, for once I have to follow the rules. Coincidentally while my genes were shouting the Mumbai Bloggers Pot Luck diner was announced and voila! I had an audience too. I decided to make Payesh. Payesh is an auspicious milk preparation made on birthdays in nearly all Bengali households. All communities across India probably have their own version of sweetened reduced milk cooked with rice/sooji/vermicelli, etc. Us Bongs, we make Payesh. Anyway, since the rest of the world does appreciate the simple poetry of a well made Payesh, I decided to make it for the dinner. First I called my Mom and quickly went through the procedure and then I got on with it. Wash and soak the rice for half an hour. De-stalk the raisins and soak them separately. Bring the milk to a boil in a large heavy bottomed vessel. I used a copper 'kalai' vessel that my Mom in law used to make biriyani. The thick bottom prevents the milk from scorching at the base and using a large vessel helps in minimising the chances of the milk boiling over. Once the milk is boiled reduce the heat and add the bay leaves and the cardamom pods. Split the pods so the flavours can blend easily. Drain the rice on a small napkin so that the water is completely removed. Drop the rice into the simmering milk and let it cook as the milk reduces. Stir this occasionally and ensure that the milk does not stick to the bottom of the vessel and burn. After an hour or so the milk would have reduced considerably and the rice grains should have literally 'exploded'. Just 2 tablespoons of rice will increase tremendously, trust me! If the milk needs to reduce some more, simmer longer. Once the rice is cooked and the milk has reduced sufficiently add the sugar. Stir well and cook for another 15 to 20 minutes. Put in the raisins too. The Payesh will thicken as it cools and a gorgeous creamy malai will form so decant it into your serving bowl while it is still hot. Decorate with flaked almonds or pistachios if you like. A deceptively simple dish to make one thing a Payesh maker needs in abundance is patience. There isn't all that much to actively do. There's hardly any prep required. But you have to keep your eye on it. The milk burns and your Payesh is ruined. Reduce the milk too much and you get a thick porridge instead of a creamy rich Payesh which is in fact what happened. An extra litre of milk was boiled and reduced in a panic and the Payesh was 'repaired'. 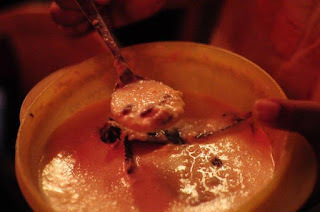 I totally love long cooked kheers too...am curious to know more about gobindo bhog chaval...where is it available here? And what rice is it similar too? It's a small grain rice with a distinctive fragrance. As the name suggests it is used to make bhog for the diety - govind (Krishna) bhog. At best you can use tukda basmati.